Rep. Rosa DeLauro, D-Conn., sponsor of the Paycheck Fairness Act, center, flanked by Lilly Ledbetter, left, an activist for workplace equality, and Speaker of the House Nancy Pelosi, D-Calif., speaks at the Capitol in Washington, Jan. 30, 2019. NEW YORK — Democrats in the U.S. Congress introduced a bill on Wednesday morning to ensure equal pay for women and transparency from employers. 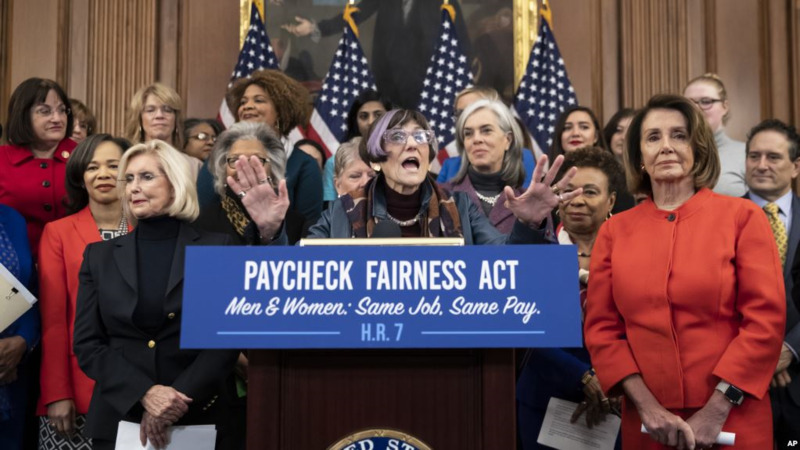 "For more than two decades we pushed, we battled to strengthen the 1963 Equal Pay Act," DeLauro said to members of Congress. "Nothing is more right, and nothing would make more of a difference to working families in this country." "If we're going to prioritize the concerns of the women across this country, then we have got to do more than just think about the wage gap," Ness said. "Join us in this fight."